Award Value: 89 Points Earn points for free DVDs. Signup free. Sam (Northern California) on 2010-12-28 18:30:05. Unfortunately we've been told by several Hollywood distributors that this movie has been discontinued on DVD and is no longer available. Sometimes they decide to re-release them though, so we'll keep our fingers crossed. In the meantime at this writing we have a some left in stock. Ah... as often happens, they discontinue then restart again later. Maybe they receive a flood of backorders or requests and change their minds? Who knows. Anyway, this is available once again. Enrique Herrera (San Jose, Costa Rica) on 2010-10-29 07:26:28. This is a different train movie. Even though it is about European trains (I grew up amongst American type trains with 4 wheel trucks and knuckle couplers) and in black & white, the picture is crisp, the plot is related to a difficult time in our World history (Second World War), and it does have a very good plot and incredible train shots. Narration CAN be turned off in special features. Would kids enjoy this? I doubt it. A director's dream! To have a whole railway to run and wreck. 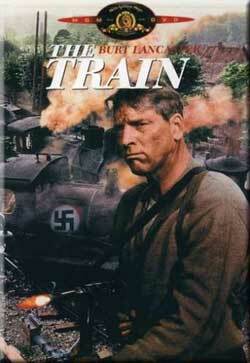 No fancy digital effects anywhere in what is really one of the best train movies of all time. Excellent old black and white movie about french patriots in ww2. Narration: There was no narration. Jeffrey Ornstein on 2010-01-23 12:27:50. If you enjoy a combination of espionage and trains, you'll definitely appreciate this movie. Aside from what's already been written about this film, we see Burt Lancaster doing all of his own stunts (he was trained as an acrobat before being an actor), and some of them are quite impressive. Also, the bombing of the rail yard is totally real and authentic - at the time of filming this movie, the SNCF was planning on renovating the yard, and let the film makers plant explosives throughout the property. We also get a glimpse of an armored locomotive. I wish we saw more of it in the movie. Great film, but also keep in mind that it's in black and white. Probably fitting given its atmosphere. If you're a fan of steam, then you MUST have this movie in your collection. This is the real thing. Not Hollywood model work although I'm sure models were used during some of the bombing scenes. You'll see real steam locomotives driven hard... throttles opened wide, drivers spinning, brakes slammed on, direction thrown into reverse while moving forward. You'll see real derailments and collisions. Fantastic for the rail fan. There is a great scene of a bearing cap being forged and a driving rod being replaced in the shop by Burt Lancaster. As a movie, the story takes place during German occupied France and involves the Germans trying to get all of France's famous art out of the country before the allied forces get there to drive the German's out. A group of French railroad men strive to delay, derail and pull all kinds of tricks to try to delay the train before it makes it to the German border.